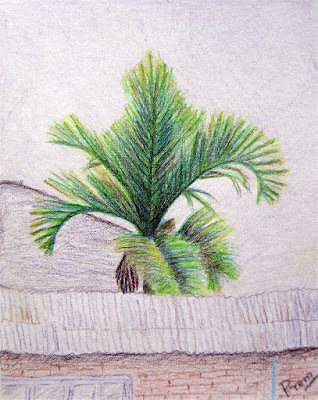 Today I am going to share the arts of palm tree in three different mediums. The scene is the same but each work is done on a separate sheet of cartridge. 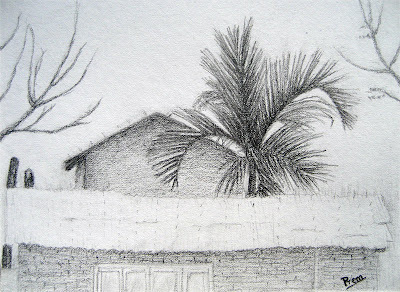 This is the sketch of palm done by using the graphite lead pencils of various tones such as 2B, 4B, and 6B. This is the first piece I have done among the arts I am sharing here because of the simplicity of sketching over using the colored mediums. However, after doing the black and white version of the palm, I was intrigued to produce the same work using the colored pencils, and later watercolor. As mentioned, this is the colored pencil drawing of the same landscape above. However, I have changed the orientation of the drawing paper to focus more on the palm tree and remove all the clutters. 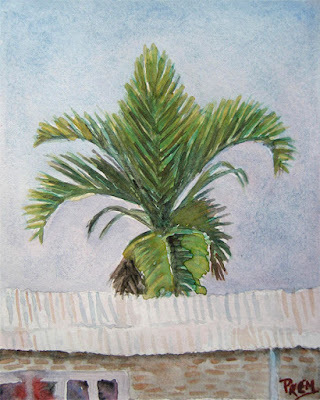 And finally, this is the watercolor painting of the palm landscape. I have however, cleared the houses and other elements in the background to simplify the painting. All three works are done on a same sized paper, that is, 14 x 17.5 cm and all these works portray the same place. If you don't mind, may I show this picture (from the graphite pencil to the water-color to one of my arts students? I am sure he will be happy and may be inspired by this. Of course, Taz. These sketches and paintings are kept here for public viewing. That means anyone can view them. I even encourage young artists to use my pictures as reference to practice art. So, you can provide them the links too. I am thinking to publicize my works under Creative Commons Non-Commercial license. So, anyone can do anything, with an attribution link, except commercializing my works directly. Keep it up it's amazing! How I digitize my arts?